Kia’s reputation for functional, reliable vehicles has grown significantly over the last decade and the mini-MPV styling of the used Kia Carens fit nicely into its range. The Kia Carens was launched in the millennium and has undergone two major overhauls in its lifespan to cater to changing technologies and tastes. First generation second-hand Kia Carens were available as a five or six-seater, with the costlier option putting a third row of seats in the rear which have to be removed manually if you want to free up the luggage space. All models come with air con, full electrics and a CD-playing stereo with an MP3 input, but if you opt for the better-equipped models then things like built-in Bluetooth for hands-free calling and even leather seats can be yours. You can expect good reliability with a Kia Caren and decent safety features. 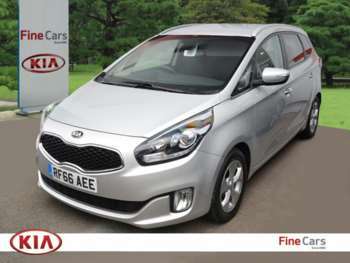 The cheap used Kia Carens is pretty competitive when it comes to performance, offering good long-distance comfort and enough manoeuvrability to ensure that it tackles urban roads without too much bother. Explore the range of used Kia Carens for sale at RAC Cars for a car that is no-fuss, good value and can provide for you and your family. Got a specific Kia Carens model in mind?